It’s Fermentation Friday! 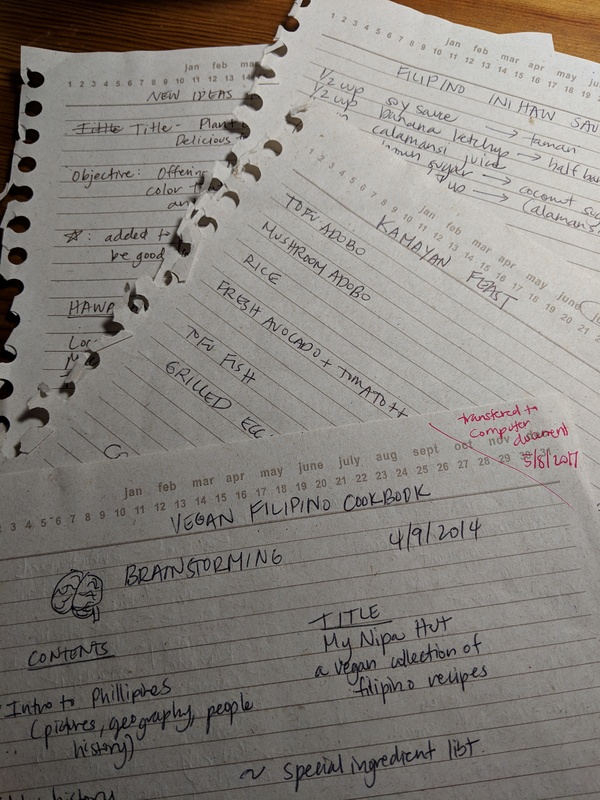 I have a recipe that’s over 4 weeks in the making! 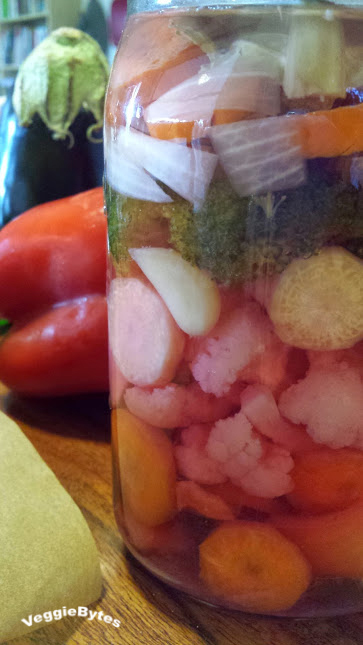 In my first post last Friday about kimchi, you see a jar of rainbow colored veggies. That’s my giardiniera hanging out on my counter for about 4 weeks of time. Here’s the layering: basil, small sweet red pepper, purple carrots, cauliflower, garlic, yellow carrots, broccoli, orange carrots and red onion. You can see that the color from the red onions and purple carrots has made the cauliflower turn pink! 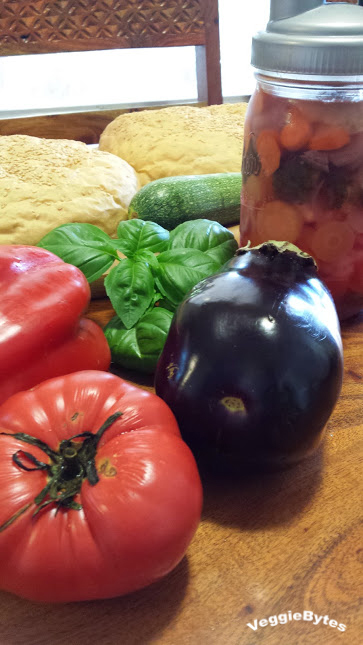 I got the recipe from the Farm Curious Fermenting Kit. You basically cut up your veggies, layer them in a very clean glass mason jar, and add a 2.5% brine. I put a small cabbage leaf on top to keep the onions from floating above the brine. Having a fermentation airlock is helpful. The number of tablespoons you use can vary due to the kind of salt you are using. Generally, stay away from iodized salt and any salt with chemical additives. Kosher salt, Sea Salt, Real Salt from Utah, and Himalayan salt are great choices. Figuring out how much salt to add is a great way to remember some math skills and also use your kitchen scale. I like the Probiotic Jar’s Himalayan Salt info sheet and also Pickle-It’s online calculator. 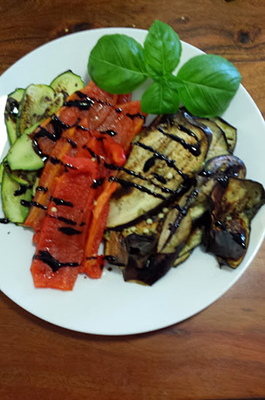 So what can you do with these Italian pickles beside including them in antipasti platters or in a salad. 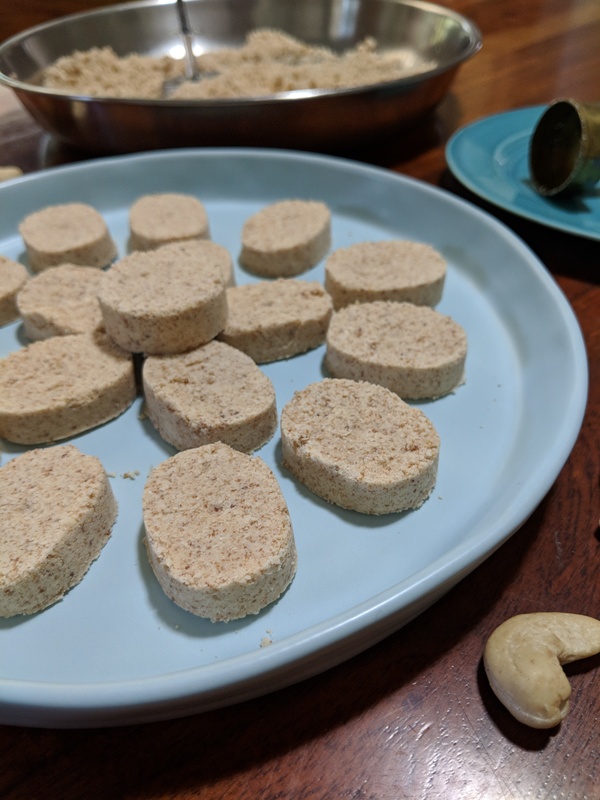 Use them in a Vegan Muffaletta! 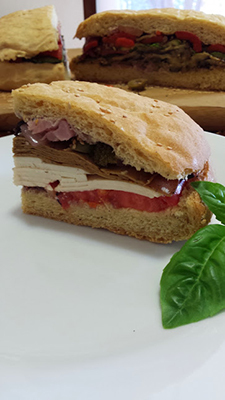 If you haven’t had a muffaletta, you are missing out on this New Orlean’s favorite. 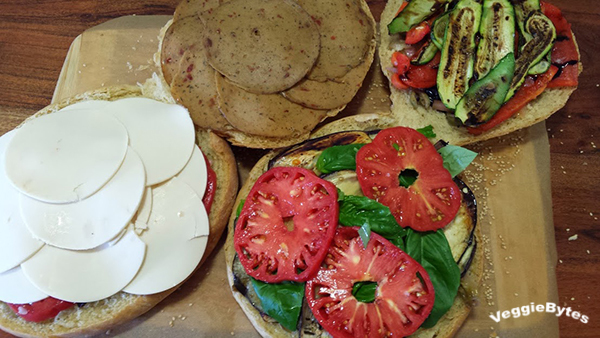 Vegans have lots of options with roasted veggies, mushrooms, vegan substitutes like Tofurkey Italian slices and Daiya provolone. One important aspect of the sandwich is the BREAD. You need a large, round and somewhat flat loaf. I have used bakery breads before like a round country French or even a round Italian loaf. However, I wanted my sandwich to be more special this time so I made the bread myself. 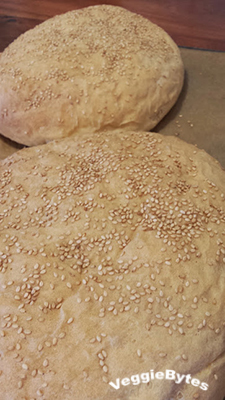 Here is a simple recipe that makes 2 beautiful breads. 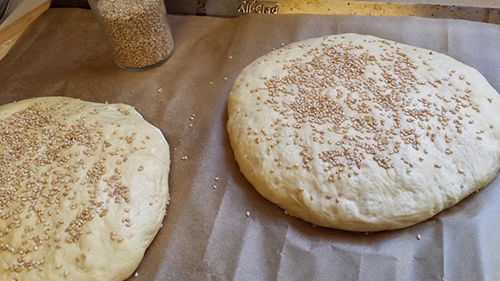 It uses one of my favorite flours: Einkorn (an older non-hybridized wheat from Italy). The flour is a lovely buff color so the inside of the bread is not stark white. 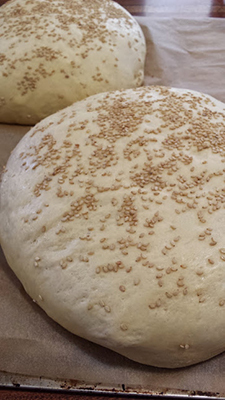 Making bread is fermentation too as the yeast creates all the expansion when it respirates. You just happen to kill off the yeasts when you bake it. In a large bowl (or bowl in a stand mixer), add water and yeast and sugar. When yeast is frothy, add salt, oil, and flours. Knead on medium until dough pulls away from side of the bowl but is still a bit sticky. 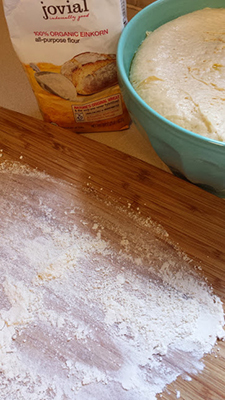 Add 1 TBSP of flour at a time to help. 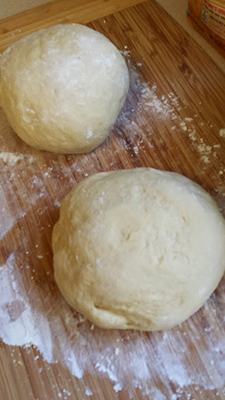 Flour your kneading surface and knead the ball for 1 minute and then split into 2 balls. Take each ball and flatten into a disk about 7 inches in diameter. Line a large baking sheet with parchment paper and place each disk on. Let rise covered for another hour or until doubled in height. Preheat oven to 400 and bake for 20-25 minutes. Cool completely before slicing and assembling your sandwich. 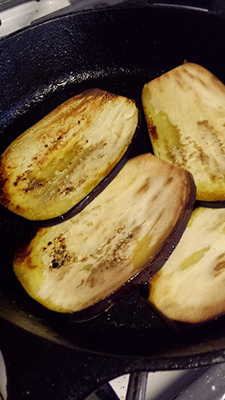 I stove-flamed a bell pepper and cooked some eggplant and zucchini slices in a cast iron skillet. I took 1 cup of the giardiniera and chopped it up and added some kalamata and green olives and capers. I put them in a bowl and added a couple glugs of olive oil. Then I sliced the bread, add the olive salad, and then the fillings. 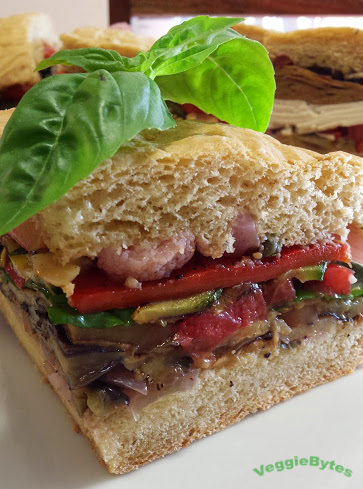 One sandwich is all veggies and the other looks like a traditional Italian meat and cheese muffaletta, with some fresh heirloom tomato. After assembly, carefully put the tops on and press the sandwich. Some people like to wrap and press for an hour. I was too hungry to wait. Since my bread was soft and not like a hard sourdough or ciabatta, I didn’t think it was necessary. We enjoyed the veggie one the most, so if you have to pick one sandwich I would stick with vegetables. I don’t think we liked the Daiya provolone very much. 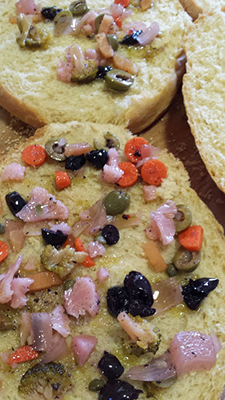 I hope that you will try making either the giardiniera or the bread if not both. The sandwiches pack well for picnics if you wrap them tightly. They taste wonderful the next day and there was no problem with sogginess. See you back on Monday for my latest Vegan MoFo finds! You had me at fermented! I love the idea of fermented Fridays (and fermented anything, really). 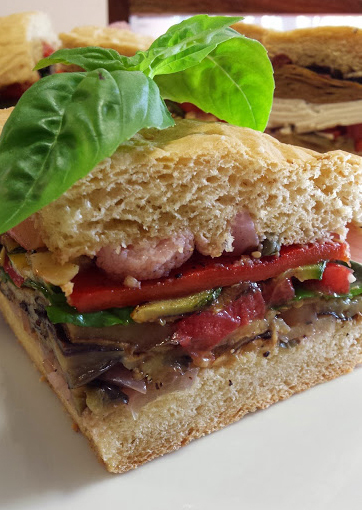 The sandwich looks ace (and I’m not a fan of the Daiya provolone either – it tastes sweet). Thanks! I never had the Daiya slices before. 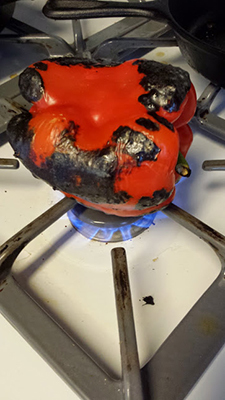 Maybe it would taste better melted?